No matter what interests or talents your daughter has, making friends at camp is a given. But what about bringing friends? We find this to be just important as making friends. Our community is made strong by the families, neighbors, and friends that invite new aspiring girls to Waukeela every summer. This helps us create a family-oriented atmosphere where each and every girl can feel like she is a part of something special…and she is! Here are a few of the ways bringing a new friend to camp can benefit your family as well theirs. As many of our Waukeela families know, summer camp is a once in lifetime experience that helps shape dreams into goals, interests into skills, and strangers into lifelong friends. Camp is an invaluable experience, but not every family is as seasoned in the camp community as we are. Many parents know the benefits of giving girls time to really connect, play, and learn on their own terms. School can sometimes be a stressful environment for exuberant thinkers and ambitious young leaders. Camp is the perfect time to help shape some of those aspirations while also giving girls a nice break from their daily lives. When your daughter brings another friend to camp, something changes. Not does this friend and new camp sister discover so much more about herself, she’s also finding more about her friendships. It’s a well-known fact that nowadays from a very young age, our daughters are spending too much time glued to screens. As girls age into young women, they begin spending more and more time calculating their friendships and self-worth by likes and follows, not face-to-face experiences. Camp can help girls disconnect from this cycle and instead find value and friendship in the most authentic way possible: while having fun! Even when we have best friends come to camp together, they learn so much more about each other and gain a new respect for each other they might not have without the unplugged summer experience at Waukeela. This is also true for cousins, neighbors, school peers, and family friends. Opening this new world of community and friendship can have a positive impact on girls for years to come. At Waukeela, taking on new challenges is a daily occurrence, but this is unfortunately does not happen as often outside of the realms of camp. Kids spend much of their time learning hard skills for their education, but not enough time learning soft skills that help them adapt to new and challenging situations. Some of the soft skills we focus on at Waukeela include communication, collaboration, self-motivation, and leadership. We offer several opportunities for campers to try something out of their comfort zone, such as trying out a new adventure activity or presenting in front of the entire camp. 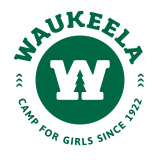 These events are an everyday occurrence because Waukeela campers feel the spirit, support, and safety that surrounds every moment of camp. This is important because girls learn that it’s ok to fail, try new things, and persevere through challenging activities. If you think about how many young girls you know in your life that could use a confidence boost, we’re sure you could come up with many. That’s because each and every girl needs the space to thrive, and at Waukeela we provide just that. The more girls we can give the opportunity to be great, the more young leaders and role models we will see in the world. When you visit camp, you can already experience much of this leadership as many girls continue their time at camp to become inspiring and compassionate counselors. Sharing this experience can be a lifechanging experience for another girl as well as your daughter. It’s more than just having your daughter’s best friend to laugh and sing with, it’s also giving another girl the chance to become the best version of herself – and that is priceless.